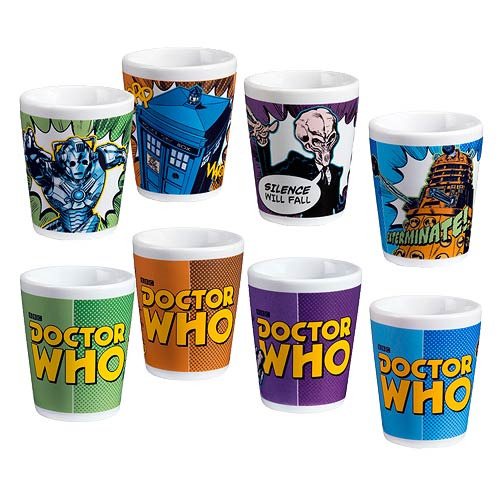 Drink to the longevity of Doctor Who with these 2 1/2-inch tall mini-glasses! In addition to the Doctor Who logo on the back, each glass in the Doctor Who Comic Book Ceramic Mini-Glass 4-Pack features a classic comic book image on the front: The Silence, Dalek, Cyberman, or TARDIS. Packaged in a full-color gift box. Dishwasher safe. Do not microwave. Ages 18 and up.